Authors: Setra, R. G. Setra; Arroyo-Almanza, D. A.; Ni, Z.; Murphy, T. E.; Roy, R.
Abstract: Stimulated Brillouin scattering (SBS) is a noise-driven nonlinear interaction between acoustical and optical waves. In optical fibers, SBS can be observed at relatively low optical powers and can severely limit signal transmission. Although SBS is initiated by high dimensional noise, it also exhibits many of the hallmarks of a complex nonlinear dynamical system. We report here a comprehensive experimental and numerical study of the fluctuations in the reflected Stokes wave produced by SBS in optical fibers. 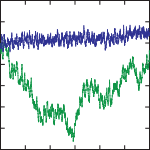 Using time series analysis, we demonstrate a reduction of dimensionality and dynamical filtering of the Stokes wave. We begin with a careful comparison of the measured average transmitted and reflected intensities from below the SBS threshold to saturation of the transmitted power. Initially the power spectra and correlation functions of the time series of the reflected wave fluctuations at the SBS threshold and above are measured and simulated. Much greater dynamical insight is provided when we study the scaling behavior of the intensity fluctuations using Hurst exponents and detrended fluctuation analysis for time scales extending over six orders of magnitude. At the highest input powers, we notice the emergence of three distinct dynamical scaling regimes: persistent, Brownian, and antipersistent. Next, we explore the Hilbert phase fluctuations of the intensity time series and amplitude-phase coupling. Finally, time-delay embedding techniques reveal a gradual reduction in dimensionality of the spatiotemporal dynamics as the laser input is increased toward saturation of the transmitted power. Through all of these techniques, we find a transition from noisier to smoother dynamics with increasing input power. We find excellent agreement between our experimental measurements and simulations.